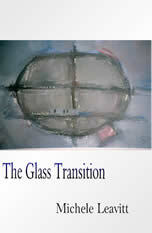 My poetry collection from Finishing Line Press, The Glass Transition, was published on June 4, 2010. The cover art was created by Lisa Delaney. Lisa and I have worked together creatively since we were six years old, and this collaborative publication is the realization of a lifelong dream.